Wind, ice, and snow storms can damage your property and cause dangerous situations. 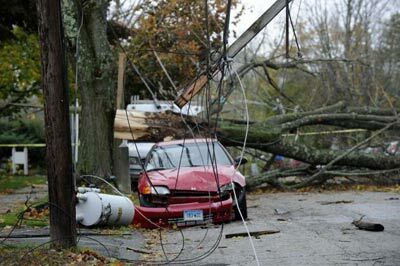 Such situations should only be addressed by properly trained tree service companies to prevent further damage to the tree, surrounding property, buildings and personnel. 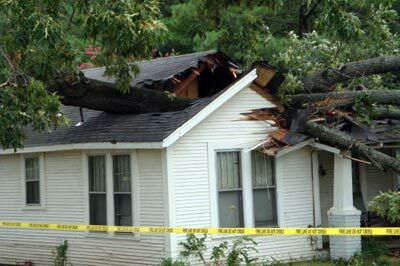 Consulting 24 Hr Emergency Service professional is the first thing you should do when you need emergency tree care. Contact UsPlease feel free to call our office at (630) 584-2221 or send us an email to schedule an appointment for your Free Estimate. Our number one priority is to provide excellent customer service to each and every customer who walks through our doors. Our friendly sales staff will be happy to answer your questions or schedule service. We are on call 24/7 for your convenience. Your crew was here today to remove the trees we had spoken of. They did an excellent job. They were fast, professional, concerned with safety, neat, thorough and very personable and polite. It was a pleasure to see an entire crew (plus additional personnel that finished their job early and came to our house to "give a hand") working so seamlessly together. Kudos to you. I will enthusiastically recommend Skyline Tree Service. Ted - My parents and I would like to thank you for the work your crew did this morning at their home. My mom called me and said they did a nice job and everything was cleaned up and looked great. It's nice to know they have such a good neighbor. We appreciate a job well done and in a timely manner. Thank you.